Editor's Note: Frances Shure, M.A., L.P.C., has performed an in-depth analysis addressing a key issue of our time: “Why Do Good People Become Silent—or Worse—About 9/11?” The resulting essay, to be presented here as a series, is comprised of a synthesis of reports on academic research as well as clinical observations. In answering the question in the title of this essay, last month’s segment, Part 4, addressed the term “doublethink,” coined by George Orwell. Doublethink is not part of Western psychology’s lexicon, but it is a defensive strategy, nonetheless, by which we hold two conflicting beliefs in our minds at the same time, and use one or the other, depending on the situation–rather like a chameleon switches colors–in order to remain in conformity with the official position..
We continue Ms. Shure’s analysis in Part 5 with the defensive mechanisms of denial and cognitive dissonance. “I admit that I seriously resist anyone messing with my worldview,” said a friend as she hurried out of the room we both occupied. I did not get an opportunity to acknowledge her honesty at the time. When I brought up her admission to her weeks later, she had no recollection of making any such statement. People who are resistant to evaluating the 9/11 evidence often forget having made honest statements such as this one, even minutes later. This forgetfulness, I believe, attests to the depth of their resistance, and the strength of their defense mechanisms, when it comes to the topic of 9/11. An imaginative person said, “I can think of so many other explanations for these 9/11 events.” This defensive deflection of the evidence was an attempt to demonstrate his intelligence and to minimize what he had heard from me—but not a true inquiry. A good friend said, “You can’t expect someone to listen to information that turns their world upside down.” Five minutes later I asked her to repeat what she had said, but she could not recall her words and got lost in confabulation. When we are faced with information that is too uncomfortable to accept, we reject this information outright or we minimize its importance. This is the psychological defense mechanism known as denial. We resort to denial to avoid cognitive dissonance, that uncomfortable and sometimes disturbing feeling of losing our emotional equilibrium when faced with new information that challenges our worldview, or when we hold beliefs that are contradictory to known facts. The discomfort motivates us to either change our behavior, change our cognition, or justify our behavior by acquiring a secondary cognition. This dynamic is common to us all. 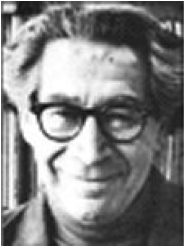 Leon FestingerSocial psychologists Festinger et al. accurately predicted the behavior of this group when the aliens did not show up. When at the appointed time there was no sign of any alien, the cognitive dissonance (tension, fear) created by the challenged belief (a sacred myth for this small group) was resolved by another automatic-writing message from Keech that God had spared Earth from destruction due to the light spread by this little group of true believers. Thus, a secondary cognition was created to mitigate the cognitive dissonance caused by the disconfirmed belief. As Festinger and colleagues predicted, the group initiated intensive proselytizing, rather than responding more logically by reconsidering the validity of the original belief (changing cognition) and then acting accordingly (changing behavior). The followers of Keech may have been severely psychologically wounded people who needed to believe they would be saved. Although most of us would not have been swayed by a Keech-type figure with such a delusion, we might well be swayed by another charismatic leader skilled in more subtle use of manipulation and/or with a less obvious delusion. Devising secondary beliefs to attempt to reconcile cognitive dissonance is common, and so is having trust and naïve faith in presidents. It behooves us, whether or not we are 9/11 activists, to recognize the importance of our own goal of becoming genuinely autonomous, individuated humans, so that we become more psychologically secure, and therefore less vulnerable to these unconscious reactions. We must also cultivate a discerning mind, so that when we encounter evidence that does not support an “official story” or what a charismatic leader may tell us, we can find the courage to speak out with solid information. Standing alone with a radically different opinion in a group of one’s like-minded peers—especially when challenging a sacred myth—can often take far greater courage than confronting those perceived as a shared enemy. Our fears of rejection, alienation, and ultimately banishment from those we love and value are probably among the greatest human fears we have. As we will see in the Asch conformity experiments described next, these types of fears might have caused the behavior of the subjects, who yielded their own correct perceptions to the wrong answers of their peers. 2Leon Festinger, Henry W. Riecken, and Stanley Schachter, When Prophecy Fails, (First published by University of Minnesota Press, 1956; then by Printer & Martin Ltd, 2008); Leon Festinger, A Theory of Cognitive Dissonance, (Stanford University, Stanford, California, 1957). 3Any point of view that resides outside conventional thinking, including the UFO issue, can foster ridicule; this is not my intention here. 4The late Col. Robert Bowman, Director of the Star Wars program under Presidents Ford and Carter when it was secret, and who subsequently exposed this program as an offensive, not defensive, program, said in a personal communication to several of us in Denver that he spoke for over an hour to Obama’s campaign director during Obama’s 2008 campaign for president about the evidence that shows the official account of 9/11 cannot be true.